Many theories have been introduced in an attempt to explain this disorder. Currently, most professionals believe it is a result of a physiological condition brought out by a life stressor. 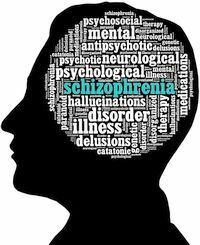 Symptoms of Schizophrenia typically begin between adolescence and early adulthood for males and a few years later for females, and usually as a result of a stressful period (such as beginning college or starting a first full time job). Initial symptoms may include delusions and hallucinations, disorganized behavior and/or speech. As the disorder progresses symptoms such as flattening or inappropriate affect may develop. See Schizophreniform for more information on diagnoses. Medication is the most important part of treatment as it can reduce and sometimes eliminate the psychotic symptoms. Case management is often needed to assist with daily living skills, financial matters, and housing, and therapy can help the individual learn better coping skills and improve social and occupational skills. There is no cure for this disorder so prognosis is poor. However, medication has been shown to be quite effective against the psychotic symptoms and therapy can help the individual cope with the illness better and improve social functioning. Absence of what is termed the negative symptoms (flattened affect, avolition, and poor social interaction) improves the prognosis significantly.